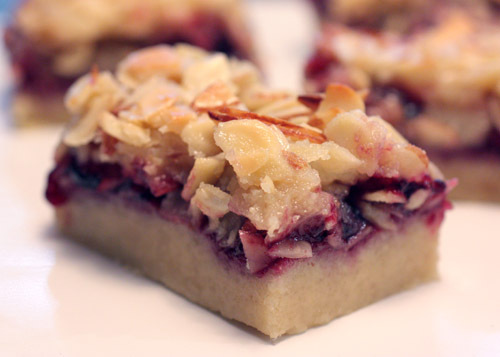 This bar sounds excellent with the black current jelly and the crunchy almonds. I am curious about the name. Please let us know if you find out about the origin of it. Yum - they look fantastic! I'm a scientist so I weight everything in the kitchen - I just can't help myself! These bars look so yummy and I love almonds. 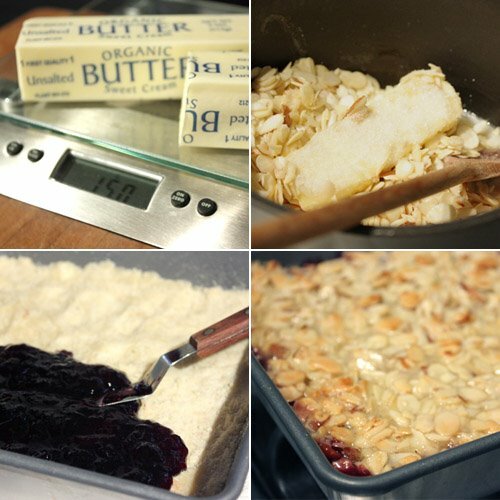 A sweet, thick jammy filling topped with crunchy, thin slivers of almonds. That's a recipe for deliciousness in my book. 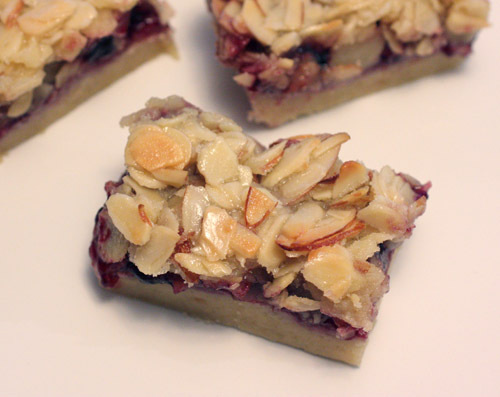 delicious combi of currant jelly & almonds! That jelly layer looks oooooh amazing! I love almonds too. Great dessert. Very yummy looking. Did you get the blackcurrant jelly there or bring it back with you from Dublin? I've been craving shortbread lately and I think that top photo just put me over the edge :) What a delicious-sounding bar. MMMMM...Lias! I love them! Beautiful pictures again! Yum! Lisa, I can not resist this delicious looking bars. I really want to make it too. The words lovely and divine come to mind! I can picture them on a fancy tray with a steaming pot of tea next to them in a tea house! Scrumptious! i still haven't gotten a scale, but it's on my list. these bars look delish! i've never heard of them! These are amazing! I love the almonds here and the bite size shapes.YUM! They are really exceptionally goood! My hubby saw your picture, he loves almond and asked if I can also make them : ) Have to wait the book become available ! Yum, that looks sinfully delicious! I love blackcurrant jelly and I love almond. So, these bars are my size. wow...these look very nice and crunchy and chewy at the same time! If I don't have sliced almonds, will chopped work as well? Janet: I'm going to update the post with the recipe since the book isn't available. Sophia: Chopped almonds should work, but I think the smaller the chopped size the better so the pieces combine well with the melted butter and sugar. The combination sounds amazing. I think I would use the blackcurrant jam, for its somewhat tart flavor. I love it! ooh! those look delicious. My mouth is watering just from looking at the photograph. These look SO good. I still have a ton of sliced almonds that I need to use up, I am definitely going to make them. In my case, it's called 'Benedict' because I'd be betraying my well-intentioned eating by overindulging in these little beauties! Never heard of these before. I also want to know how it got that name. Interesting. Out of curiousity, did you ever try making these with marmalade? And if so, how much did you increase the sugar by? Allie: Sorry, no, I haven't tried these with marmalade. Great idea though. If I recall, this is a nicely sweet cookie and might not require much additional sugar. Very interesting and easy to prepare recipe. I live in Romania and I have a blog "CAIETUL CU RETETE" that collect interesting recipes. Once I try it, post it on another my blog “PASIUNI”. I ask permission to post this recipe, translated in Romanian, on my blog " CAIETUL CU RETETE ", and the link to your blog "lisa is cooking". Thank you for your comment and for visiting my blog. Yes, you may post the recipe with a link back to my blog. Hope you enjoy the benedict bars!